I just finished reading The Sweet Life in Paris by David Lebovitz, and I highly recommend it. I have found his observations about life in Paris so validating. Apparently it was not just my paranoid imagination — people really were playing chicken with me on the narrow sidewalks while simultaneously judging my wardrobe. In addition to his witty and astute observations, this book contains several wonderful recipes which I can’t wait to try. Our first three tomatoes of the season just turned red, so any recipe with the word tomato in it immediately catches my eye these days. Believe it or not, I have never made a panzanella (bread salad) before, probably because I’m not that keen on soggy bread. But for some reason, this recipe appealed to me yesterday, and I’m glad I went with my instincts. This salad was so flavorful and light, yet filling enough to stand alone for dinner on a hot summer night. 1. Preheat oven to 400 degrees F (200 degrees C). Spread the bread pieces on a baking sheet and toast until deep golden brown, about 15 minutes, stirring once or twice as they’re toasting. Set aside to cool. 2. In a large bowl, whisk together the mustard, salt, pepper to taste, garlic, vinegar and olive oil. 3. Remove the stems from the tomatoes, slice in half and squeeze out the juice. Cut them into 1-inch pieces. Cut them into 1-inch pieces. Cut the cucumber into 1/2-inch pieces. 4. Add the tomatoes and cucumber to the bowl with the dressing. Mix in the olives, onion, herbs and bread pieces and toss well. Taste and add more salt, oil and vinegar to your liking. 5. Crumble the feta over the top in large chunks and toss briefly. Let stand 1-2 hours before serving. 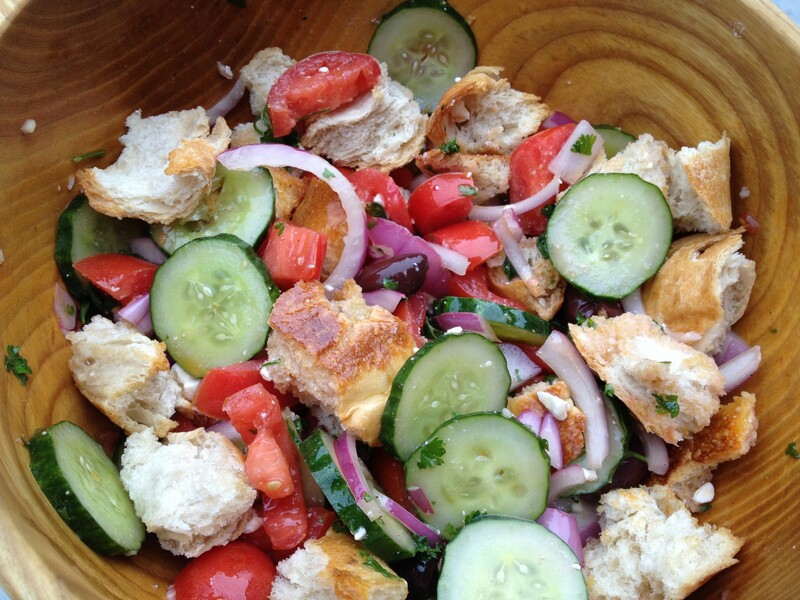 This entry was posted in Salads and tagged david lebovitz, panzanella, The Sweet Life in Paris, tomato and sourdough bread salad by Mom Mom's Apron. Bookmark the permalink. Sounds like I’d better get new clothes before going to Paris! Your salad looks fantastic! I must make this!! There’s a ton of recipes on your blog I have to make! I’m stressed out about it! The sourdough in the salad looks so yummy! I’m getting hungry. LOL I will make that this summer for one of our pool picnics!